What Universe Is This, Anyway? : 13.7: Cosmos And Culture Evidence of ultra-fast cosmic expansion forces us to confront the possibility that the multiverse exists. But how will we ever know? It's a problem that could leave us tangled up in knots. Observing the multitude of galaxies in our own universe is a piece of cake. Observing the multiverse, if such a thing exists, seems impossible. 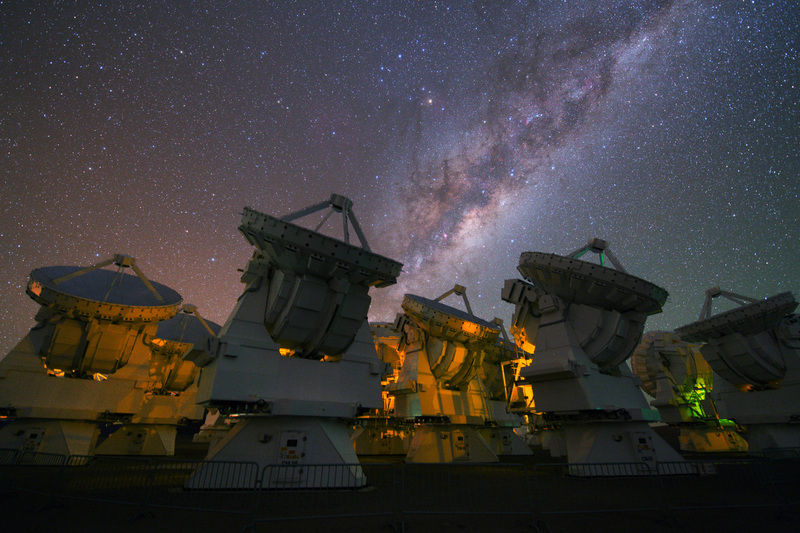 Above, the Milky Way rises above the ESO's ALMA observatory in Chile. Let's take a walk on the wild side and assume, for the sake of argument, that our universe is not the only one; let's say there are many others, possibly infinitely many, "out there." The totality of this bizarre ensemble is what cosmologists call the "multiverse," a hypothesis that sounds more mythic than scientific, a conceptual troublemaker that inspires some and outrages others. It all started in the 1980s, when physicists Andrei Linde, from Stanford University, and Alex Vilenkin, from Tufts University, independently proposed that if the universe underwent a very fast expansion early on in its existence — what is called an inflationary expansion — then our universe is not the only one. This inflationary phase presumably happened at one trillionth of a trillionth of a trillionth of a second after the supposed beginning of time. You may ask, How come these scientists feel comfortable talking about times so ridiculously small? Wasn't the universe ridiculously dense also? Well, the truth is we don't really have a theory that is able to describe physics under these conditions. What we do have are extrapolations based on what we know today. The supposition here is that we can apply essentially the same physics at energies that are about one trillion times higher than the ones we can probe at the Large Hadron Collider (LHC), the giant accelerator in Switzerland, housed at the European Organization for Nuclear Research. Not quite the same physics, but with similar actors. We don't know if there were scalar fields at the cosmic infancy. But it's reasonable to suppose so. When we don't have data, the best that we can do is to build reasonable hypotheses that can be tested by future experiments. Science needs to take risks to advance. This is why everyone got so excited with the recent results from the BICEP 2 group: they claim to have found a clear signature from inflationary expansion, something that would be very difficult to explain in any other way. We discussed the signature itself last week. Today, I want to explore what it has to say about the multiverse, if anything. To see how we model inflation with a scalar field, picture a ball rolling downhill. As long as the ball is at a certain height from the bottom, it will roll down. It has stored energy. At the bottom, we set its energy to zero. We do the same with the scalar field. As long as it is displaced from its minimum, it will fill the universe with its energy. In regions of space large enough, this energy prompts the fast expansion of space that is the signature of inflation. What Linde and Vilenkin did was to add quantum physics to this picture. In the world of the quantum, everything is jittery; everything vibrates endlessly. This is at the root of quantum uncertainty, an idea that flies in the face of common sense. So, back to inflation, as the field is rolling downhill it is also experiencing these quantum jumps, which can kick it either further down or up. Here comes the twist: when a sufficiently large region of space is filled with the field with a certain energy, it will expand with a rate related to that energy. Think of it as a bathtub with water at a given temperature. Different regions of space will have the field at different heights, just as different bathtubs could have water at different temperatures. The result is a plethora of inflating regions, each with its own rate. Very quickly, the universe would consist of myriad inflating regions, that grow unaware of the surroundings: the universe morphs into a multiverse. Further, even within each region quantum fluctuations may drive a sub-region to inflate. The picture, then, is one of an eternally replicating cosmos, filled with bubbles within bubbles. Ours would be but one of them. This is all very nice and inspiring. But is it science? To be scientific, a hypothesis needs to be testable. Well, can you test the multiverse? The answer, in a strict sense, is "no." Each of these inflating (or contracting regions, there are also failed universes) is outside our cosmic horizon, the region that delimits how far light has traveled since the beginning of time. As such, we can't see these cosmoids or receive any signals from them. The best that we can hope for is to find some signal that one of our neighboring universes bruised our own space in the past, a sort of cosmic collision. If this happened, we would see some specific patterns in the sky, more precisely, in the radiation left over after hydrogen atoms formed some 400,000 years after the Bang. So far, none of these signals have been found, and the chances are, quite frankly, remote. We are thus stuck with a plausible scientific idea that seems untestable. What are we to do? The multiverse brings in another ingredient: the possibility that the physics of different universes are also different. Things get pretty nebulous here, as there seems to be confusion about two kinds of "different." There could be different values for the constants of nature (like the electron charge or the strength of gravity) or there could be different laws of nature altogether (like energy and electric charge conservation). The point is that our universe, to harbor life (as we know it), has to obey a series of very strict requirements; small deviations are not to be tolerated, as for example, in the values of the constants of nature. So, the multiverse brings forth the question of naturalness, or how common is our universe and its laws among the myriad universes belonging to the multiverse. Are we the exception or the rule? The problem is that we have no way to tell. To know if we are common we need to know something about the other universes, the kinds of physics they have. But we don't. We also don't know how many are there, and this makes it very hard to estimate how common we are. If there are only 5 albino zebras in one million, we can say something about how common albino zebras are. But when we don't know the animals or what is changing among them, life gets real hard. To make things worse, if there are infinitely many cosmoids, we can't say anything. Infinity gets us tangled up in knots. How are we to establish what is normal when, in the realm of the infinite, everything is possible? It is a mind-twisting notion that an infinite multiverse would have infinitely many copies of this and every other possible kind of universe. Everything becomes a huge wash and nothing stands out. That's why some physicists are worried about the multiverse, to the point of loathing it. If this keeps on going, we will loose any grip on what makes this universe different. And different it is, given that we are here to ask questions about it. If our universe is not special from a multiverse perspective, it is surely special and unique for us. And that makes — or should make — all the difference. There is nothing more important to science than its ability to prove ideas wrong. If we lose that we undermine the very structure of the scientific method.